BaitRageous: A "Bass Pro Shop Bomb" went off in my man cave. A "Bass Pro Shop Bomb" went off in my man cave. I've taken a few days to work on the entrance of my studio. Yes, it does look like a "Bass Pro Shop bomb went off in a man cave", but believe it or not, I don't think that I purchased any of these items at Bass Pro, however I do love BPS. I painted the painting/maps and added the Great Blue Heron to the door panels. I made the fishing pole lamp and added the old tackle boxes, which were my dad's. I was born and raised to honor all things lake, rivers and bays. I have been lucky to turn what I love into a nice little business. This area gives me inspiration as I walk though the doors on my way to the studio. Now, check-out the photo. See anything interesting? In the lower, middle of the photo, I had a canadian goose photo bomb this picture. Yes, he stuck his head up just as I snapped the picture. 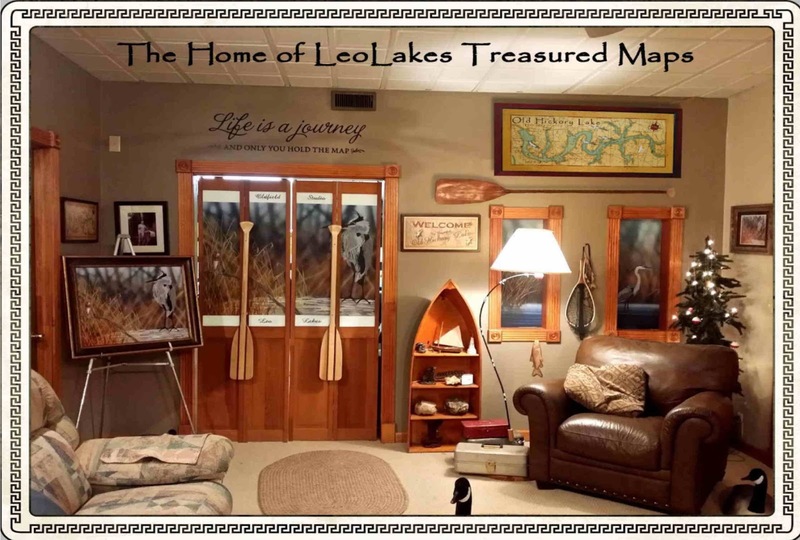 Also, check-out my maps, they make the best fishermen's gift! I have over two hundred on my website that can be purchased right from the site, or I can do custom and personalizes lake, river or bay maps, too. I have maps of Lake Winnipesaukee, Table Rock Lake, Greers Ferry, Lake Lanier, Gaston Lake, Choctawhatchee Bay, Toledo Bend, Raystown, and many others. Oh yeah, I hide a tiny fish in the waters of all my maps that folks love to search for. Find out more interesting facts about my treasured maps by going to LeoMaps.com.